Tuesday May 28, 2013. 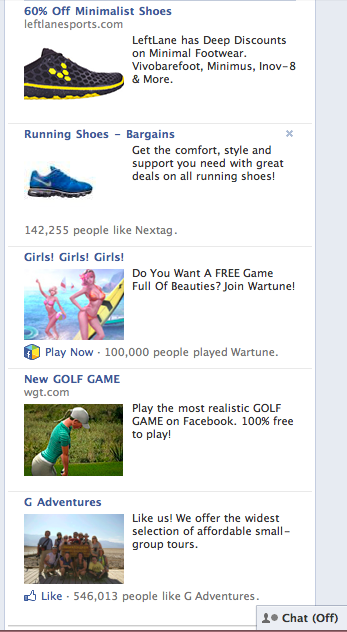 It’s been two months since I last observed what FB was thinking about me. Shoes. Video Games. Some spirituality (Aura, Carbon-Titanium Bracelet). At first glance, it would seem FB has changed, if ever so slightly, its mind about me, cuz there is the addition of something about MOA. So maybe I am improving myself, moving to a higher level (the higher level on earth). I don’t feel so defensive these days about what FB thinks about me. Maybe FB is troubled, ever so slightly, about upsetting me, making me think about things I am uncomfortable with. You know, all that talk going around about ‘Ending Up On Facebook’. You know, the idea of ‘ending up’ … anywhere. Unsettling. I hope FB is becoming more aware of my feelings in a less mercenary (less exploitive) way. However, I am not trusting FB, don’t you worry. Self-serving FB is up to something, no doubt. Huh? Hmmmm. I think FB is being clever with, ‘Something Big’, but I’m not sure. Maybe FB is pretending not to know I bought the plane ticket. 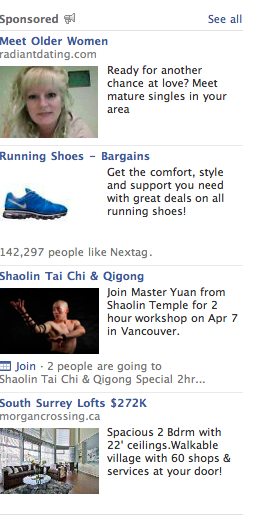 No, the shoes repeat thing is too obvious – FB is playing it cool, the business as usual ‘thang’. Well, let’s see who wins this one cuz I ain’t makin a move on the internet til tomorrow night. Ha! Today FB is issuing a challenge to meet older women. is still insisting I get shoes, is feeling a lack of religion in my life, and is interested in my housing. Meeting older women … I think I met a woman who was 100. That was about 20 years ago. So she would be about 120 now … I should have nabbed her. That would have been a record impossible to even match. The other stuff FB is concerned about doesn’t seem unusual anymore. I actually have many pairs of shoes. I wont list them all, but to give you an idea: I have a pair for taking the garbage out; another pair for hiking; squash; lacrosse; tennis; running; beach; dress shoes; casual dress; semi-casual dress; mostly casual but could pass for semi-casual dress; casual casual in a subtly dressy way; casual and there is no other word for it; old shoes; out of style shoes but will come back; old shoes but too cool to toss; and there’s the pair I wear every day. Religion is a bit of a problem cuz everyone is beautiful in there own way … like a ray of sunshine on a cloudy day … and so I dont understand much more than thinking about how nice it is to think that my feet are on the ground and so are everyone else’s. Shoes don’t enter into the thought, just feet. Doh! The accommodation thing is a bit random. I love where I live and it would take some sort of event, not wanting to live somewhere else, to make me move. Holy Damn! I just realized that when you do WordPress, WordPress starts up with recommending things. Now what? Incredible news about FB! Fb wants to travel with me, go to see music, but first I have build a camper van and get my criminal record erased … that’s crazy, FB! Cray-Zee!! I must buy shoes, I must buy shoes. Now Facebook is saying I have no shoes or boots, that my connection to adults is a game, and that I am part of an adventure race somehow. My life is not much altered since this morning in FB’s mind. Even though I did so much today and discussed so many things with so many interesting people, FB seems not to detect I had a great day. And it’s sunny in Vancouver. Perhaps FB believes I have a shoe fetish. If FB is mocking me, FB is tired, that’s what it is. Let’s give FB a rest and maybe FB will like me better tomorrow. Saturday Morning. FB is hanging in there with observations that are tending towards seeing me as an aware person, someone less concerned about shoes and living in a video game and more concerned with the planet. How green is Vancouver? I guess I will find out by accessing the internet via FB’s advisory notice (whatever). However, I just realized that FB has less to say about me – only two connections; there are usually at least four. Has FB lost interest in me and moved onto other ‘friends’? I don’t know how I got this way. Facebook says these things about me and it upsets me. However, it is nice too know how you are being perceived by others and I appreciate the honesty. What is sad about me, then, is that I don’t have shoes, that the only the females I can interact with and sports I can play are only available in video games and that I travel in small groups. I say, ‘sad’, because of what Facebook said about me and how I feel now. Has my contact with ‘people’ been limited to made-up characters? Why Facebook, why? Maybe if I am nicer to FB, FB will be nicer to me. To have a friend, you have to be a friend. I will see what happens and let you know what FB thinks of me tomorrow. Today I am going to be nicer in every way.